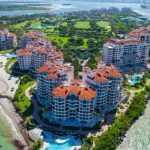 The Friday File: The highest income zip code in the USA is Fisher Island, FL 33109; technically Miami Beach. It’s an island accessible only by boat, helicopter, or water taxi with population of 132 and average income of $2.5 million/year. Second is Atherton, CA 94027; 7,000 residents and average income of $1.5 million/year. Palm Beach, FL 33480 is 3rd. Among the 10,468 residents, average income is $1.3 million/year; affordable!